Cris Cyborg has more fighting words for Ronda Rousey after her UFC 168 title defense. Ronda Rousey already has her next opponent, but her most significant potential challenger is still out there and she’s not even in the UFC. Cris Cyborg tweeted after Rousey’s win over Miesha Tate on Saturday night at UFC 168: "Ronda I’m coming to get you!" Cyborg is currently the Invicta FC 145-pound champion. She was under contract with Zuffa last year after fighting in Strikeforce, but opted out because she said she was unable to get down to 135, Rousey’s weight class and the heaviest division the UFC has for females. That’s an odd statement, since Rousey-Cyborg is the biggest women’s fight – and one of the biggest fights period – that the UFC could possibly make. Rousey fights Sara McMann in February at UFC 170. She refuses to move up in weight to fight Cyborg - and why would she since she’s the champion at 135? – and Cyborg says she can’t physically make 135 pounds. Rousey doesn’t believe her. The Rousey-Cyborg talk has been quiet lately, especially with Rousey and Tate being the hot rivalry all fall because they coached against each other on The Ultimate Fighter. But Cyborg called Rousey out again in November after Rousey claimed she could beat UFC heavyweight champion Cain Velasquez in a fight. Invicta FC president Shannon Knapp told FOX Sports earlier this month that Cyborg is likely to return to the cage in February or March against either Julia Budd or Ediane Gomes. 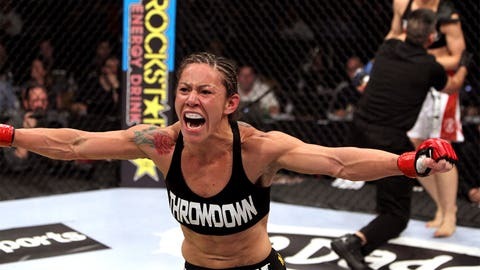 Cyborg, once known as the best women’s fighter in the world, has not lost since 2005, but failed a drug test in 2011, which has thrown some cold water on her run. Invicta has a strong working relationship with the UFC, as evidenced by the transfer of 11 women’s strawweight fighters to the UFC three weeks ago. So, it’s possible that if the two sides can figure something out, a superfight between Rousey and Cyborg wouldn’t be difficult to accomplish.